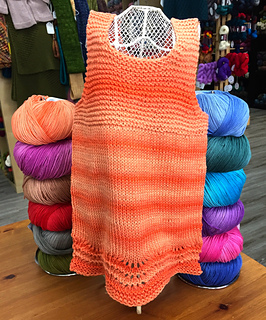 The unique construction of this adorable little sleeveless dress makes it fun and quick to knit. 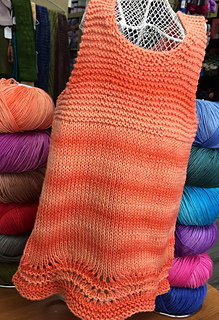 This pattern has it all - seamed and seamless knitting, working flat and in the round, and working from the bottom up, and from the top down! The bodice front and back are knit flat in garter stitch, and worked from the bottom up. After sewing the shoulder and side seams, stitches are picked up for the skirt, which is worked in stockinette stitch in the round, from the top down. The skirt is finished off with an easy lace pattern at the bottom edge, to add a touch of flair. 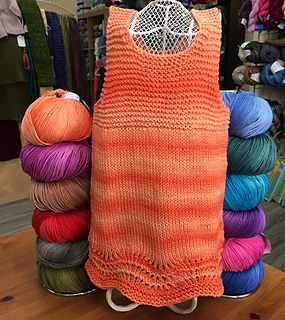 For those who prefer knitting to purling, you’ll be happy to know that the dress is designed with almost all knit stitches. There are just a few rounds of purling at the bottom edge of the skirt. (yarn overs), and decreasing (K2tog and SSK). (262 yds pure cotton DK), size 5 needles (straight or circular for bodice, which is knit flat) and size 6 needles (24” circular) for skirt. I hope that you’ll enjoy knitting this adorable little dress, and please post photos!